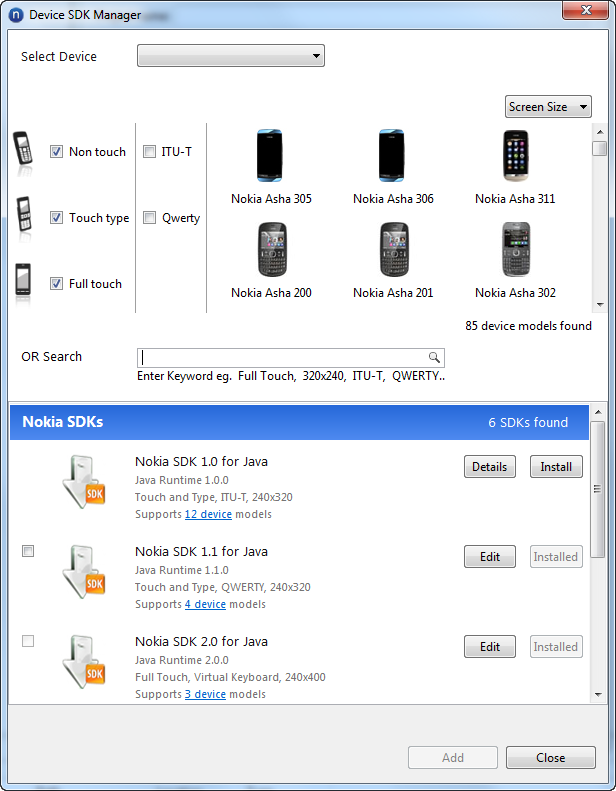 Nokia released a new version of the Nokia SDK for Java. In additon to supporting AshaTouch devices (devices with touch only input for you and me ), it includes a new IDE. This new IDE is based on Eclipse MTJ. For those who remember, it also integrates to SDK discovery features of the now discontinued Pulsar distribution of Eclipse. 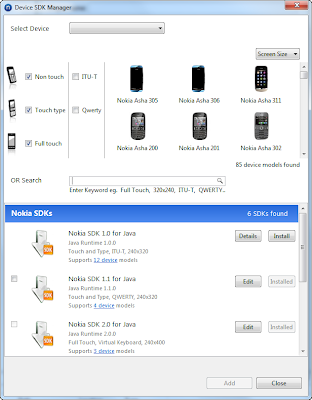 The main focus on this version of the IDE was to make it easier for newbies to Nokia platforms to discover and install the necessary tools and get started. On the discovery part IDE does a good job. As you can see from the screenshot it provides an extensive array of filters to find the right SDK for your project. You should expect to see more features coming to the IDE and some of them will also appear on MTJ. Besides the fact that I am the project lead for the Eclipse MTJ, this IDE makes me happy for an additional reason. I believe this is a product of my internal evangelism that has taken years to build up. For those of you who have not worked for the large companies (lucky you) this may sound strange. But large corporations are like a community of their own and you basically spend more time advocating to your company than outside your company. In this case, I had a positive result but in evangelism you encounter more frustrations than victories.